There has been a lot of media publicity recently about how sugar is “evil” and sugar is responsible for weight gain not fats etc.. Simple sugars (glucose, fructose, lactose, sucrose etc) offer very little nutritional value and will rapidly raise your blood sugar levels causing a rapid insulin response. Repetitive cycles of this puts increased stress on your insulin system, all organs, circulatory system, digestive system and nervous system. 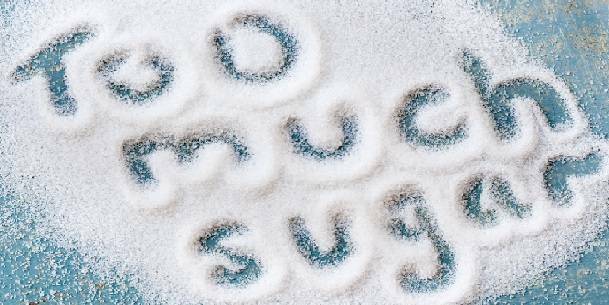 Recently it has been reported the average Australian diet consists of 30- 40 teaspoons of sugar per day… 160g! The American heart association recommends 6 teaspoons (25g) per day for females and 9 teaspoons for males (38g). However, many health organisations and research papers believe this is still too high and say the recommendations should be 20g females and 28g males. I encourage everyone to track how much sugar they are eating for an average day and see how you compare. Include all drinks. Also bear in mind if you want to decrease body fat and weight then really you need to be below this average number.